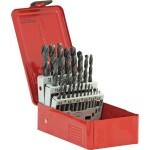 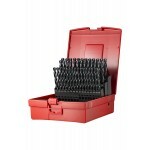 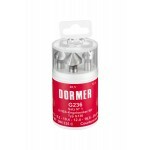 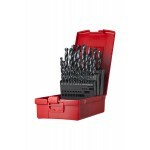 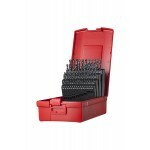 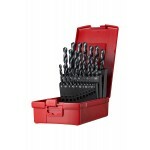 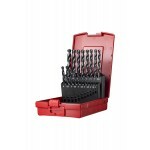 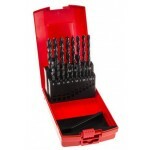 DORMER A100 JOBBER DRILL 29 Piece SET - A190206 29 PIECE SET 1.0 mm to 13 mm&..
DORMER IMPERIAL HSS JOBBER 29 PIECE DRILL SET A19018 29 PIECES A100 DRILL SET CONSISTING ..
DORMER A100 HSS JOBBER DRILL 19 Pieces SET - A190201 19 PCS, A100 DRILL SET CONSISTING ..
DORMER A100 HSS JOBBER DRILL 41 Piece SET - A190203 41 PCS, A100 DRILL SET CONSISTING OF ..
DORMER A100 HSS JOBBER DRILL 25 Piece SET - A190204 25 PCS A100 DRILL SET CONSISTING OF 1..
DORMER A100 HSS JOBBER DRILL 91 Piece SET - A190209 91 PCS A100 DRILL SET CONSISTING OF 1..
HARD CUT DRILLS HC23456 ..
DORMER A095209 91 PIECE DRILL KIT 91 PIECES. 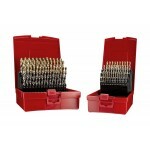 SPLIT POINT, TiN COATED DRILL SET 1.0mm TO 1..
DORMER L115101 DRILL AND TAP KIT 14 PIECES HAND & TAP DRILL SET E500 M3, M4, M5..
DORMER A09518 DRILL KIT 29 PIECES. 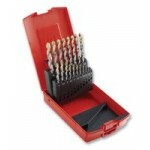 SPLIT POINT, TiN COATED DRILL SET 1/16 TO 1/2 X ..
DORMER A095204 DRILL KIT 25 PIECES. 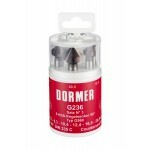 SPLIT POINT, TiN COATED DRILL SET 1.0mm TO 10.0..
DOMER COUNTERSINK KITS - G560 COATED KIT CONTAINS 6 HSS COUNTERSINKS SIZES 6.3, 8.3..